Authors: D. Clowe, M Bradač, A. H. Gonzalez et al. It is the age of precision cosmology. The accepted model of cosmology- LCDM (Lambda-Cold Dark Matter)-is cruising with theoretical predictions and observations that point to a nearly flat universe filled with Dark Matter and Dark Energy. Knowing since 1937 that galaxies are too massive to only be filled with baryonic matter, astrophysicists over the last few decades have settled with the Cold Dark Matter (CDM) model. In this model, dark matter particles move slowly compared to light, and only rarely interact with each other gravitationally. Velocity dispersion curves of galaxies require 85% of their mass to be dark. Moreover, independent measurements from the cosmic microwave background (CMB) and 3-D maps of structures in the universe imply much more mass than what can be observed through electromagnetic interactions. Today’s classic paper is an insight into another such indirect observation, that solidified our belief in what we believe is non-baryonic matter. The biggest challenge of indirect dark matter(DM) observations has been the spatial coincidence of DM and baryonic matter i.e. most models that help us infer dark matter had a location that was roughly the same for both light and dark matter! A system in which DM and baryons were spatially segregated is ideal for such a study. Where do we find something like that? Perhaps the image below would help! Fig 1. A merger of two galaxies, seen via Hubble (Photo Credits: NASA). These are some of the most dynamic events seen in the cosmos. 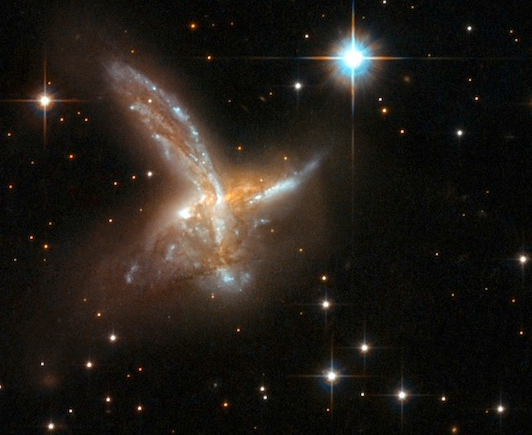 Galaxy mergers are some of the most violent events in the universe. Galaxies are made up of about 2% stars, 5-15% gas and plasma, and the rest is dark matter (hypothetically at least!). During collisions, stars rarely collide, the gas and plasma interacts through gravity as well as electromagnetic friction-like interactions, and the dark matter is expected to be collision-less and pass right through at high velocities (~4000-5000 km/s). Once merger has taken place (over a period of a few million years), an interesting result is seen. The Bullet Cluster,discovered in 1998, is the prototypical example of galaxy mergers. In 2006, the authors of this paper have had the pleasure of presenting three sets of measurements, conclusively demonstrating that the events described in the paragraph above have been observed in the Bullet Cluster. Galaxy plasma emits radiation in the X-ray (called Bremsstrahlung, or braking radiation, measured using the Chandra space telescope). Stars emit optical and infrared light(measured using Hubble and Magellan). Hence most components of this merger can be spatially traced. What about dark matter? Fig 2. a) Optical images from the Magellan telescope with overplotted contours of spatial distribution of mass, from gravitational lensing . b) The same contours overplotted over Chandra x-ray data that traces hot plasma in a galaxy. It can be seen that most of the matter resides in a location different from the plasma (which underwent frictional interactions during the merger and slowed down). Gravitational lensing of background galaxies caused by the Bullet cluster helps us spatially place the mass within the cluster. Putting all these measurements together, this study concluded that the spatial centre of dark matter concentration was mostly segregated from the spatial centre of baryons observed. Statistically, the study claimed that there was only a 1 in 10^15 chance that this spatial segregation was a fluke. In other words, they are dead certain that what we see is dark matter and baryons interacting differently during a collision- a certain home run for DM fans! There have been other alternative explanations proposed for the gravitational lensing signals from the Bullet cluster, but none of them have been statistically close to the explanation offered by presence of a massive concentration of DM, as well as conforming to what cold dark matter looks like in the Lambda-CDM model. These alternate models don’t simultaneously explain all observations that hint towards a Cold Dark matter universe, which is a major problem. Hence, it is certainly safe to say that the field of Cold Dark Matter is here to stay. The Top 12 of 2012 Emergent Gravity faces its First Test in Galaxy Lensing Gravitational Lensing in the Canary Islands What is the Most Massive Object in the Universe? and this astrobite popped into my inbox. Hello, it is Bremsstrahlung not Brehmmstrahlüng. My apologies and thanks. Correction made!